Deepika: My name is Deepika. 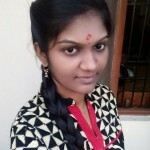 S. I am a 2015 graduate from Sri Muthukumaran Institute of Technology. I am passionate about my life and enjoy whatever I do. I also believe each day is special and unique. Deepika: As an engineering graduate we are less exposed to the real word scenario and the concepts which we study are mostly theoretical. Initially, it was quite hard to meet the industry’s expectations. 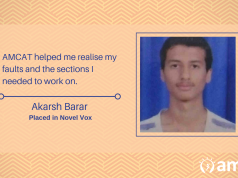 Aspiring Minds: Tell us about your experience post giving the AMCAT test and how AMCAT helped you in getting the job at a software MNC? 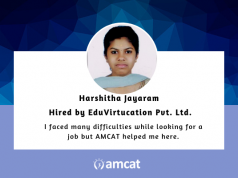 Deepika: Before interviewing at a software MNC, I attended two to three interviews but thanks to team AMCAT, I did not have to look around much and got selected in a software MNC itself. 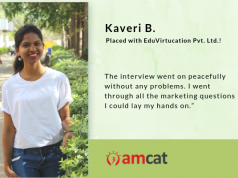 Deepika: Yes, AMCAT is a good platform to get access to the top MNCs. Keep a positive attitude and have a will to learn. Be specific on your technical points. Next articleWhat does your signature say about you?